New American Paintings is a juried exhibition-in-print. Entries from thousands of emerging artists are reviewed by experienced curators before selection. Forty artists are chosen to appear in each bi-monthly edition of the magazine. Further content focuses on the medium painting, influences upon the direction of painting, and the role that painting plays within the art world. 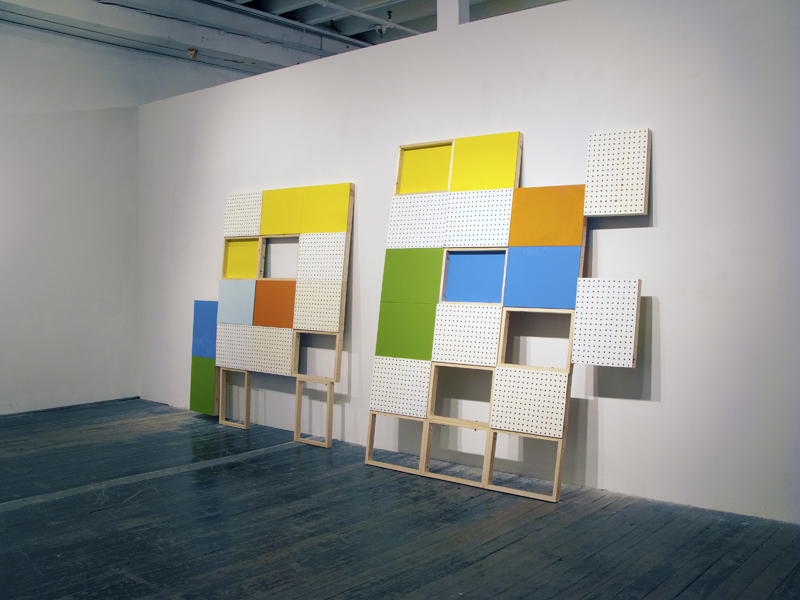 Featured currently in the magazine is Judy Rushin‘s sculptural painting series Modular which are made to be disassembled and reconfigured and are often site specific. Individual modules are aggregated into compositions for new exhibition layouts, then stacked and shipped. 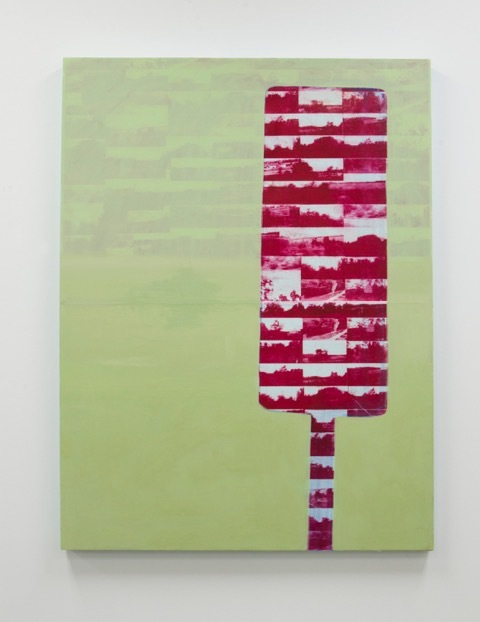 Rushin’s Modular paintings offer the idea of practical necessity as an evocative conceptual and material framework. There’s a clear immediacy to them, perhaps because they reflect our own untethered geographies. Judy’s inspiration for the pieces stems from the idea of practical necessity. Previously, while making painting installations on large canvasses, she was confronted with the restrictive cost of shipping. In order to lessen this cost, Judy came up with her modular system through the inspiration of both modular architecture and furniture. As a result, Judy’s works are able to be packed into multiple medium sized boxes and then reassembled on site as large as the situation required. I’ve talked about this before, how the practical needs of the studio practice inform my work, and how this, in turn, has become a thematic element of the work. So the work grew out of a practical need, but through that need I found an opportunity to engage my work and its audience with new meaning. Practicality is not an exciting subject but it’s a reality for most of us. 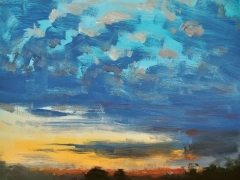 Judy Rushin earned her MFA from Georgia State University and is currently a Professor of Painting and Drawing at FSU. My inventive capacities were challenged as I worked at the same location looking in the same direction each day. My durational project follows in the footsteps of contemporary artists such as Jennifer Bartlett and Marina Abramovic, likewise pushing the limits of mind and body…my canvases convey the light of the setting sun and its emotional impact on the landscape. Currently Noah is both a working artist and an adjunct Professor of Painting and Drawing at FSU. Florida State University student Scott Bell will also be featured in New American Painting issue 117. This issue is going to be focused on emerging MFAs from around the country. Every year the magazine sponsors six publications. Five of the six annual competitions focus on geographic regions while the sixth is only open to current Masters of Fine Arts candidates who are attending schools in the United States and graduate within the current year. Mirroring network automation, I use custom code to push forward the practice of painting. Many of the paintings are large and temporary, made with house paint directly on the wall. The palettes are taken from color forecasts created just before the housing bubble burst. Many of Joelle’s recent works and research focuses on housing trends that complicate relationships to place. One such piece is Packet Switching, created during an overseas residency in Kassel, Germany. 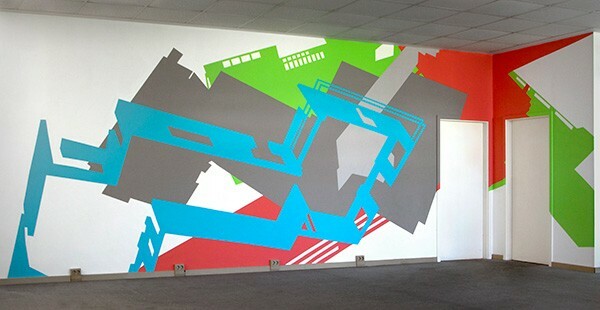 Based on a 3d digital model of the Bauhaus School at Dessae and 2012 American color forecasts both Dietrick and Owen Mundy created a wall sized temporary painting of the building. Writing custom software to deconstruct the source code and related fragments of this famous modernist building, they further remixed these fragments in an original application created in Processing…Chaotically removed from their original references—the building components, the art historical connections, and the experience in an overseas residency—all echo the technologically-driven fragmentation that led to the global financial crisis, related housing collapse, and high vacancy rates that allowed the exhibition to exist.